In honor of the citizens of the eight Pacific Islands who declared May 2nd World Tuna Day, we wanted to take time to explore how a utilitarian tool like the fish hook took on beauty and meaning within the Polynesian culture. The Parties to the Nauru Agreement (Papua New Guinea, Federated States of Micronesia, Marshall Islands, Tuvalu, Kiribati, Nauru, Palau, and the Solomon Islands) all have Polynesian heritage sharing technologies and design over thousands of ocean miles. From Hawaii through the Pacific Islands to New Zealand one can see evidence of the shared history of the vital fish hook. 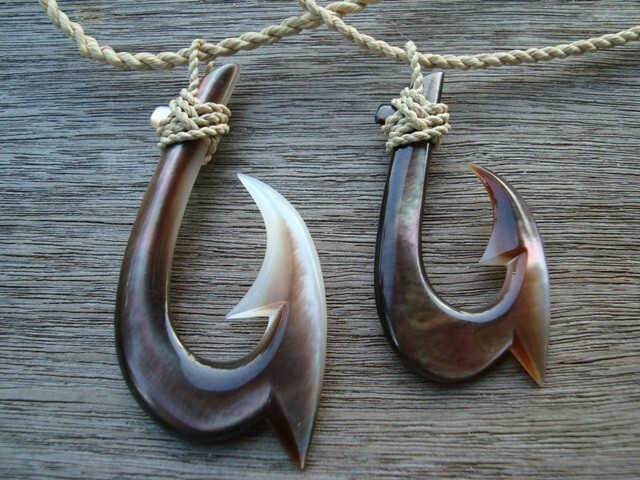 Known in Hawaiian as the makau, the fish hook represents strength, prosperity and respect for the sea. 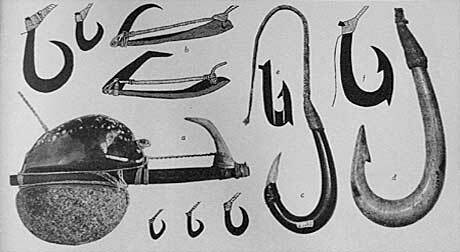 In the early days of Polynesian settlement in Hawaii, fishermen created fish hooks out of every available material they could find. Using tools and files made from coral and stone, they chipped and carved fish hooks out of whale and human bones, shells, wood, and even from the teeth of dogs. Ancient Hawaiians believed that a makau necklace made of bone was a spiritual link to their ancestors. A carving worn by family members over many generations is a meaningful heirloom. Stories of creation narrate that Maui, the Hawaiian demigod, created the Hawaiian chain of islands by dragging his fish hook on the ocean floor. He convinced his unsuspecting brothers in the canoe to paddle furiously by fooling them that he had caught a great fish. With their efforts, Maui’s high mighty fish hook, called Manaiakalani, dragged the land mass out of the ocean and the Hawaiian Islands were born. Nowadays, the fish hook necklace is made of several different types of material such as koa wood, mother of pearl, fossil bone or in some cases, from ancient mammoth ivory and shark teeth. The modern-day fish hook is strictly ornamental but the meaning behind the Hawaiian fish hook necklace is still relevant. Contemporary Hawaiian jewelry artists who create fish hook jewelry and pendants usually make two styles. A simple hook is one made from a single material be it wood or bone. A composite hook is constructed from two types of material such as wood and bone. By varying the positioning of the barb along the hook, artists come up with different creative looks. Even in modern-day jewelry, some Hawaiian artists have taken pains to use old Polynesian techniques in tribute to the meaning behind the Hawaiian fish hook necklace. Some use natural fibers such as sennet from the coconut or fiber from the olona plant which was deemed so strong that it was used as rigging on sailing ships. Another natural fiber used comes from the hau plant, the yellow hibiscus which is endemic to Hawaii. The fiber is so strong that it was commonly used to make fishing nets. Fish hooks and octopus lure illustration from “Hawai‘i: A Pictorial History” By Joseph Feher, Bishop Museum Press, Honolulu, 1969. By observing the care taken by the ancient Polynesians to securely lash the fish hooks, we start to understand the meaning behind the Hawaiian fish hook necklace. In the ancient culture, a knot was deemed a sacred binding between man and the gods. In the importance they paid to knotting and cording, the Hawaiians were similar to other ancient cultures. The Incans for example used knots to store information. Although this was not much used by the Hawaiians, their Polynesian cousins in New Zealand, the Maori, would carve images of gods onto the shaft of the makau. This practice has been adopted by contemporary Hawaiian artists to make “tiki makau”. Images of benevolent gods such as Lono, the Hawaiian god of peace and prosperity, are popularly carved onto Hawaiian fish hook pendants.